Campus Health Voice project staff volunteer Casey Hamilton, and student volunteers Stephanie Wright of Okotoks, Alta. 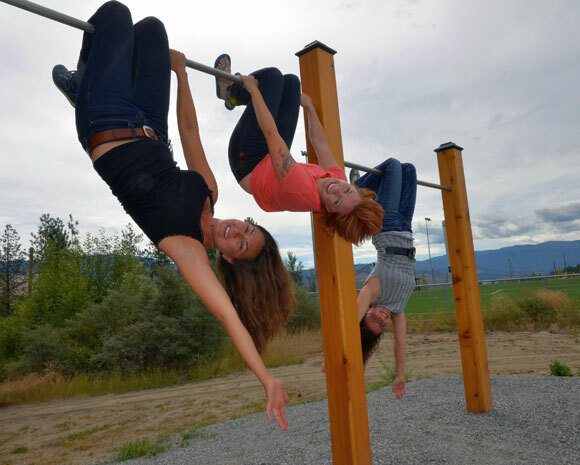 and Linée Peters of Vernon try out one of the fitness stations on the new Campus Community Fitness Loop at UBC. When: Wednesday, September 3, from 2 to 4 p.m.
Where: Campus Community Fitness Loop, located outdoors between the Administration Building and Nonis Sports Field. The UBC Okanagan Trails Action Group is hosting the grand opening of the Campus Community Fitness Loop on Wednesday, September 3, from 2 to 4 p.m. The Heat mascot, Scorch, and other athletes will be demonstrating the equipment. Everyone interested will be able to try out the fitness loop with the support of campus recreation staff. The Campus Community Fitness Loop is an outdoor exercise circuit with seven different fitness stations featuring multiple workout suggestions. The loop provides full-body drills and can be used by everyone on campus at no charge. Inspiration for the project came from Campus Health VOICE 2012-2015 research. Results indicated that many students, faculty and staff wanted to be more physically active and desired more outdoor and affordable options on campus. The project partners on campus include Facilities Management, the School of Health and Exercise Sciences, University Relations, Campus Health and VOICE students. The project was initiated and led by the UBC Okanagan Trails Action Group. A Healthy Workplace Initiatives Program grant provided funding support.